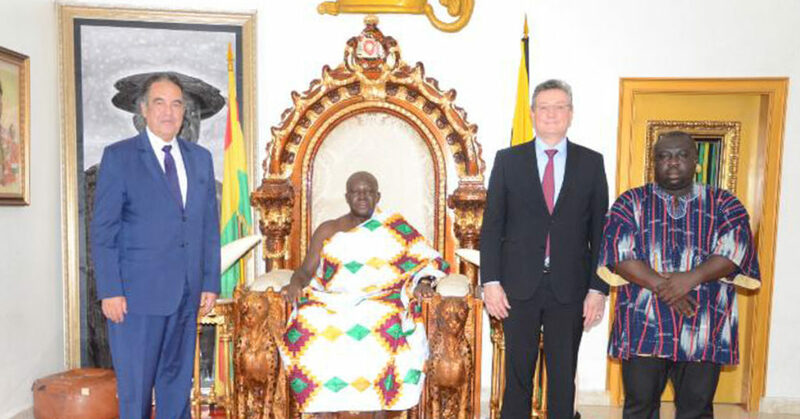 Particularly involved in the development of wind projects in Ghana, Gaia Energy have been received in Kumasi by the King of Ashanti, in presence of the Ambassador of the Kingdom of Morocco to discuss about the wind energy projects developed by IFC/GAIA platform in the region. This audience have confirmed the importance of those projects in the region, and more generally the will to reinforce the renewable energy sector for both Kingdoms. Picture: From the left to the right, H.E. Mohammed Farahat, Ambassador of Morocco in Ghana, His Majesty the King of Ashanti, Mr Alain Kerboriou, CEO of Gaia Energy and Mr Hillarius Ayidzoe, from Gaia Energy Ghana » .